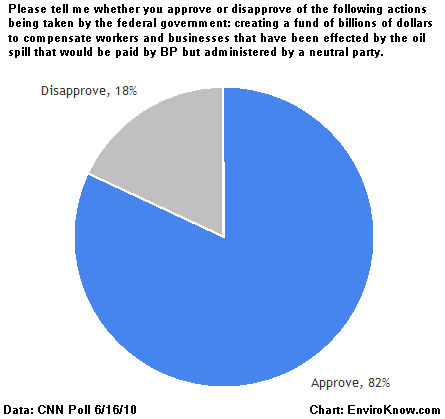 CNN released new polling Thursday with fascinating data on how Americans feel about the response to the disastrous oil spill in the Gulf of Mexico. Using the poll’s toplines (PDF), I’ve created a series of charts which present the data in a far more useful format. Since CNN doesn’t provide the crosstabs we don’t know who the 18% are. I’d be willing to bet they’re almost all Republicans. Further solidifying the case that the Republican party is out of step on BP accountability, a solid majority of Americans feel President Obama is not being tough enough on the company. 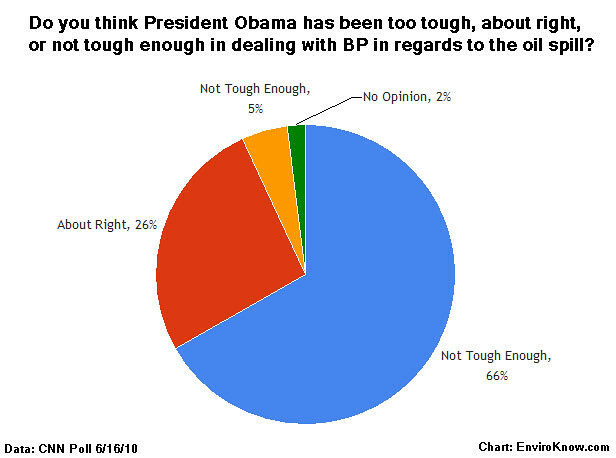 As you can see, just five percent think the president is being too tough on BP. With some conservatives rallying to BP’s defense and Republican leadership continuing to scramble to contain Joe Barton’s mess, Democrats would be wise to stay on the offensive. 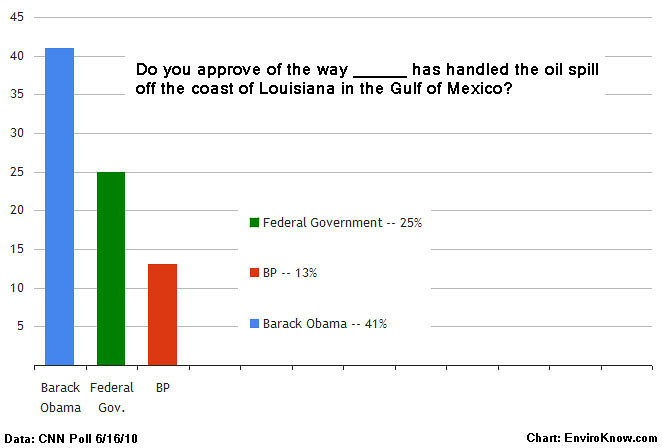 Incredibly, just 13% of Americans approve of BP’s handling of the crisis. A previous CNN poll conducted May 21-23 found that 24% approved. Again, since CNN does not provide crosstabs we don’t know anything about who these 13% of Americans are. Recent Rasmussen polling shows that they are likely to be Republican, white conservative, male and over the age of 65. While focusing the story on a minor slip in President Obama’s approval on the issue may bring in links from conservative blogs, it is a disservice to CNN’s readers. The poll contained far more relevant and newsworthy findings that would have made more compelling headlines had they chosen to go that route. Josh Nelson is a blogger, activist, and avid news junkie. He is currently the Manager of New Media at a Washington, DC area PR/Communications firm. In his spare time he enjoys arguing on the Internet, spending time with good people and talking politics. He can be reached at josh.nelson.dc@gmail.com. Josh blogs about sustainability and politics at EnviroKnow.